Tiny? Sure, but I know that every once in a while, one of those extra small blue butterflies can take your breath away. That’s how much of my time was spent on Qedesh trail in Israel’s Upper, upper Galilee region. Just 15 minutes from the small city of Kiryat Shimona, this trail wends its way through a valley. On your left the valley walls conceal the Hot! border with Lebanon, on your right the valley rises some 300 feet. The two mountain goats I saw there made for Fun! on this trail. March 2015, and tens of millions of Spring wildflowers were attracting lots of butterflies. You find yourself automatically following each and every male with your eyes. Will this one reveal the blue that Amazes? 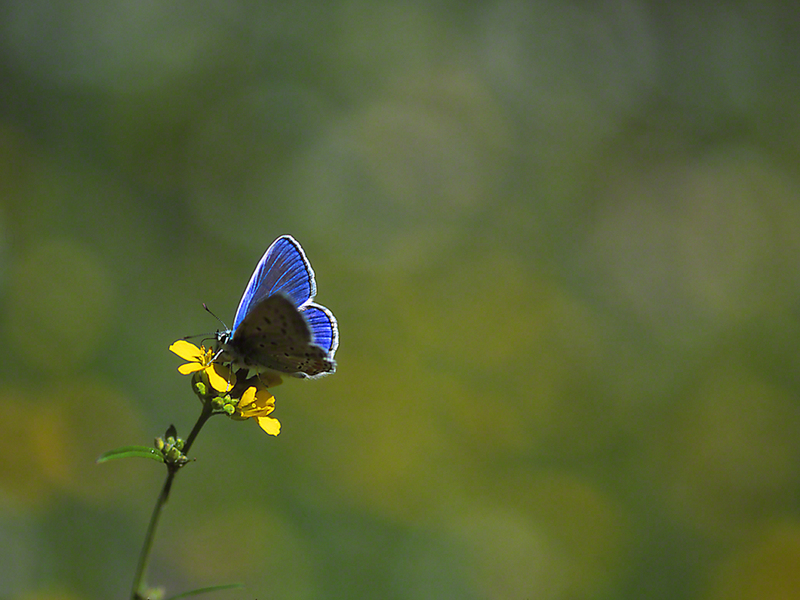 Amongst the many dozens of blue butterflies that were flying (female blues have brown upper wing color), was this one. The world: Fresh. Fresh. I carefully did my approach, went down on my left knee, resting on my Tommy #507 garden kneepads, and slowly raised my Canon with its 100mm/2.8 macro- lens. Then the critical re-look, is he still there. Yes, he is. Pop, pop, pop, pop, pop, I expose one shot after another, this angle, that angle, hey, try that angle. My goal, a satisfying image that shares with you the Wow! moments I’m feeling, marveling at the blue that deserves to be on the palette of a Master. Which of the blue butterflies? I’m not prepared to make that call, with too little underwing to guide us.